Stephen Curry scored a game-high 37 points, leading the Golden State Warriors to their second consecutive championship with a 108-85 win against the Cleveland Cavaliers in Game 4 of the NBA Finals Friday in Cleveland. 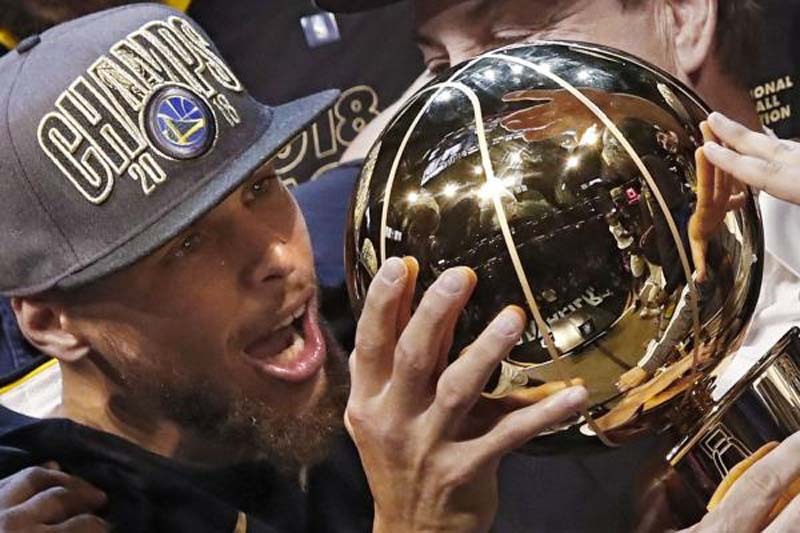 The Warriors sharpshooter also earned his third championship in four seasons. Kevin Durant scored 20 points and had 12 rebounds and 10 assists, receiving his second NBA Finals MVP in as many seasons. He averaged 28.7 points, 10.7 rebounds and 7.5 assists per game in the series sweep. "We used the experience last year to our advantage," Curry said. "We knew they were going to come out with a tough first punch. And we answered it and ran right back at them and set the tone for the whole game." LeBron James scored 23 points and had eight assists and seven rebounds in his sixth career NBA Finals setback. The Cavaliers' largest lead in Game 4 was one point. "I wondered if we could hit a switch someway, somehow," James told reporters. "Because of the course of the regular season, it was just like, I don't know." Golden State came out hot, with Curry netting 12 points in the opening frame at Quicken Loans Arena. The Warriors used a 11-0 run from 10:37 to 8:24 to propel a 34-25 advantage in the quarter. Cleveland staged a comeback in the second quarter, using a 9-2 run, capped by a LeBron James dunk with 7:12 remaining in the half to take the lead. The Warriors and the Cavaliers each scored 27 points in the frame, but Golden State still held a 61-52 lead at the break. Klay Thompson caught fire in the third quarter and the Warriors piled on. Curry's "Splash Brother" showed off his wet jump shot all over the court, netting 10 points in the third quarter as the Warriors outscore the Cavaliers 25-13 in the frame. Golden State pushed the lead to 28 points in the fourth quarter and outscored the Cavaliers 22-20 down the stretch. Friday's loss marked the second time a James-led team has been swept in the NBA Finals. His Cavaliers fell in four games to the San Antonio Spurs in the 2007 NBA Finals. James will become a free agent this offseason if he chooses to opt out of his player option for the 2018-2019 season. "It was a tough season," Cavaliers coach Tyronn Lue said. "We went through a lot, but I think it made us tougher, made us stronger. The new guys who had a chance to play in the playoffs for the first time, the new guys who had a chance to experience the Finals, which you dream of doing when you're a kid. They had that experience." "I told those guys now they see what we have to do to get better and take that next step."